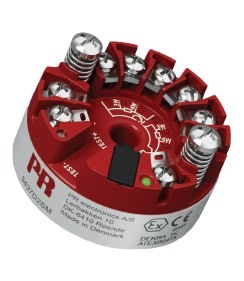 PR Electronics, a manufacturer of analog and digital signal conditioning modules for application in industrial control and factory automation, recently introduced it's PR 5437 2-wire HART temperature transmitter. The new PR 5437 allows customers to protect high-integrity process measurements, e.g. in flare stacks or reactors, with an automatic backup in the event of primary sensor failure, while continuously checking on the validity of process values. It also provides the best accuracy, stability and reliability across a wider ambient temperature range of -50°C to +85°C. Additionally, sensor redundancy and drift detection ensure maximum uptime and process validity, while NAMUR NE107 compliance makes for easier process diagnostics and preventative maintenance scheduling. A full IEC 61508-2010 functional safety assessment up to SIL 3 means that the PR 5437 can also be trusted to perform in the most critical safety applications. Download the PR 5437 2-wire HART 7 Temperature Transmitter manual here. To learn more, contact Power Specialties by visiting https://powerspecialties.com or by calling (816) 353-6550. Happy 4th of July from Power Specialties!